First peek. Team Sky rolling discotheque. The VIP Lounge at the Club Sky rolling disco. The disco ball is put away when the dance club is in transit. Travel safety thing, baby. Team Sky unveiled the rolling Club Sky Disco on their web site this Friday. The former Volvo buses have been transformed into the hottest club on the ProTour circuit. Paris Hilton is sure to crash this club soon. 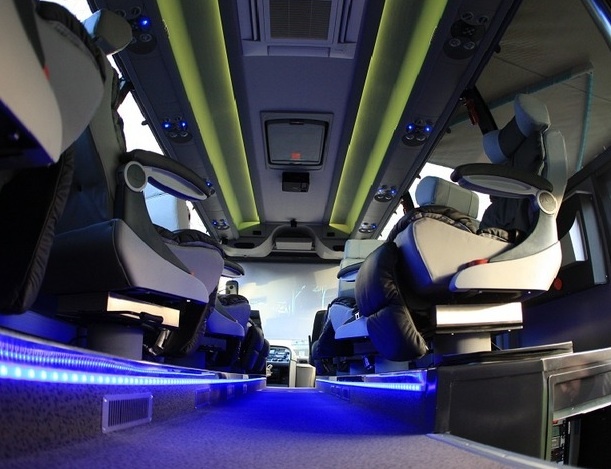 The space age design includes mood lighting and nine leather furnished seats for the riders and their party entourage. The seats even promise electric calf supports and integrated storage space for iphones and ipods. The state-of-the-art sound system will pump electronic, R&B soul and late night down-tempo grooves. “We play whatever the riders and their ladies want,” said driver and DJ Reggie “Bubbles” Dawkins. After-hours cocktails and dancing and other festivities are promised along with wide screen movies. Then as the evening winds down, VIP guests are invited to slip behind the club’s set of clear sliding pulse doors which ice up at the touch of a button. There, they’ll discover a lavish shower that provides a relaxing and intimate ending to a long exciting day of cycling. The club will cater to an exclusive, upscale clientele and also features a champagne and massage suite at the back of the rolling club. “Everybody likes to get loose, you know. Don’t matter if you just won Milan San Remo or not, it’s all a party,” said Bubbles. Given that the red-hot club has no fixed address, a red LED beacon will extend into the night sky to ensure the riders and revelers can always find Club Sky. Team manager and bouncer David Brailsford summed it up: That’s what it’s all about, making these guys so proud they’re partying for Team Sky.” No, wait, he said “riding for Team Sky.” Sorry, slip of the keyboard. « Workin’ for the Man. Livestrong now hiring writers.